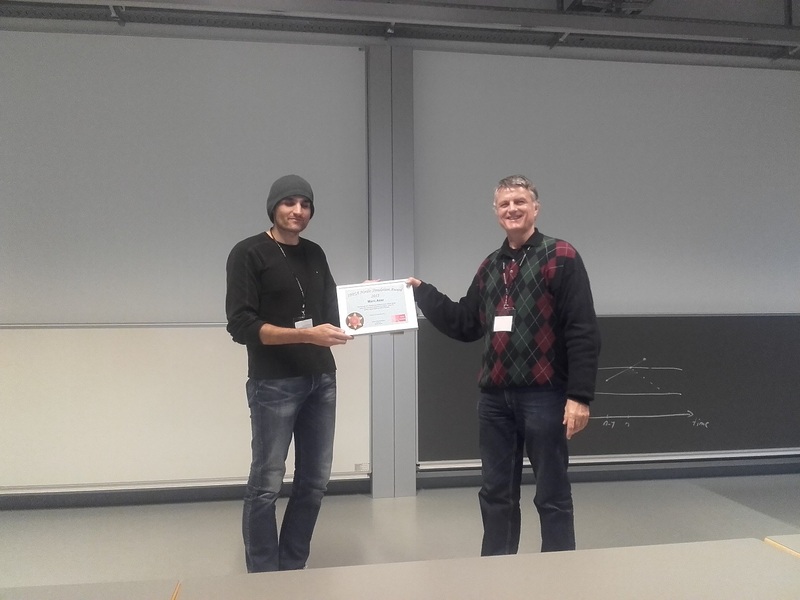 The IBPSA Nordic Simulation Award 2015 was given to Mark Azar from EQUA Solutions, see picture. The presentations at BuildSim Nordic event 2016-26--27 are now available, see them. Invitation to seminar "Praktisk bruk av simuleringsverktøy for beregning av energi og inneklima i bygninger" Lillestrøm, Norway, October 20, read more and register before October 10. Final program for the BuildSim Nordic event in Trondheim September 26-27 is now available, read more. Preliminary program for the BuildSim Nordic event in Trondheim September 26-27 is now available, read more. Thank you all who have submitted their abstracts to the the BuildSim-Nordic event which will take place in Trondheim, Norway 26.-27. September 2016. Due to summer holidays period we are extending the deadline for abstract submission until 28.Aug! Deadline for submitting an abstract to BUILDSIM-NORDIC 2016 CONFERENCE extended to August 14. Submit an abstract (deadline July 31) and read the preliminary program for BUILDSIM-NORDIC 2016 CONFERENCE for ph.d. and master students, which will take place September 26-27 at NTNU in Trondheim, Norway. BUILDSIM-NORDIC 2016 CONFERENCE for ph.d. and master students will take place September 26-27 in Trondheim, Norway. The program and invitation will be published soon. Register and read the preliminary program for BUILDSIM-NORDIC 2015 CONFERENCE, which will take place November 2 - 3 at Aalborg University in Aalborg, Denmark. Deadline for registration October 22. Softwares added to folder Commercial Software. Read the program and invitation to BUILDSIM-NORDIC 2015 CONFERENCE, which will take place November 2 - 3 at Aalborg University in Aalborg, Denmark. Deadline for abstracts is September 30. BUILDSIM-NORDIC 2015 CONFERENCE will take place November 2 - 3 in Aalborg, Denmark. Read he program and invitation will be published soon. EQUA is offering hands-on courses in IDA Indoor Climate and Energy (IDA ICE). A link to detailed course information and registration can be found below. Open lectures During the fall the Royal Institute of Technology (KTH) in Stockholm gives the courses "Energy and indoor climate modeling in buildings" and "Sustainable buildings - design, construction and operations" (both at Master’s degree level). As a part of these courses EQUA will hold lectures and hands-on exercises in IDA ICE. As a customer and user of IDA ICE you will now have the opportunity to participate in a selection of these lectures at no cost. The lectures are held in Swedish. To register please send an e-mail to info@equa.se no later than the day before the current lecture. Note: The number of places are limited. Developments in IDA ICE for the new Finnish Building Code 2012. The presentations from the Nordic PhD-seminar in Aalborg University are now available. Place: Aalborg University, Sohngaardsholmsvej 57, 9000 Aalborg, Denmark Time: 8-9 December 2011. Refurbishment of the Existing Building Stock. Covers research on barriers and drivers as well as strategies and technical solutions for refurbishment, …. IBPSA-Nordic made its initiation meeting in Aalto University, Espoo- Finland on 26.8.2011. Twelve delegates from four countries Denmark, Finland, Norway and Sweden attended the meeting. During the meeting, elections for the Board posts took place for the first two-years round. The names of the Board post and members can be found from the PEOPLE page. The by-laws of the organisation can be found in the ABOUT page.